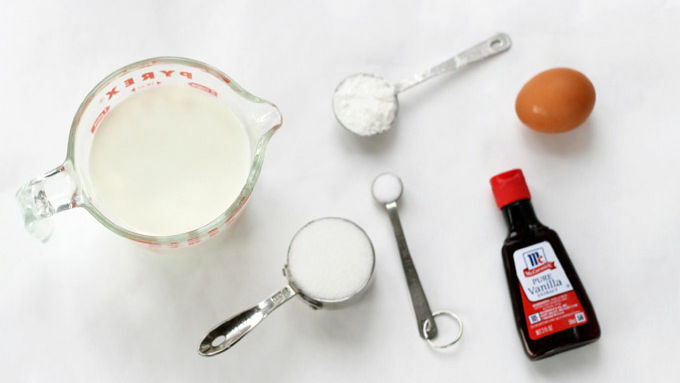 To make the pudding: Combine 1/4 cup of milk, cornstarch, salt and egg in a bowl and whisk well. Set aside. 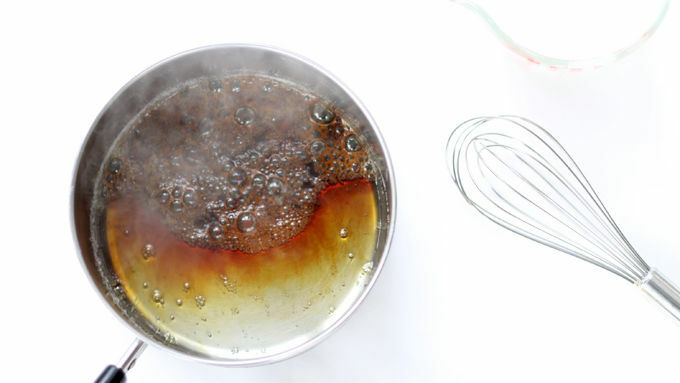 Stir together the sugar and water in a saucepan. Heat without stirring over medium high, occasionally swirling the mixture by tilting the pan, until the sugar turns a deep caramel amber color, about 6 minutes. Watch the mixture closely to avoid burning. 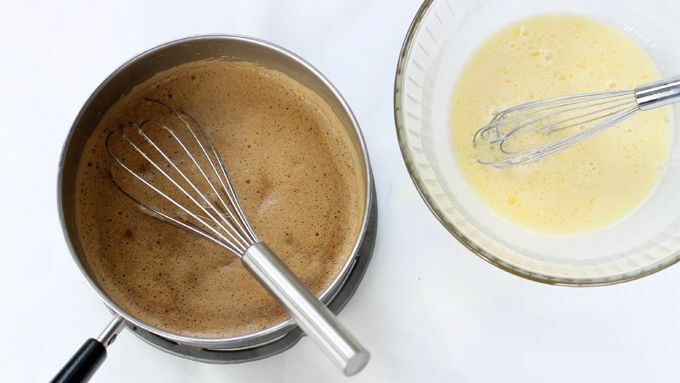 Remove the pan from the heat and slowly whisk in the remaining milk. The sugar will harden and get sticky. Place the pan back on low heat and simmer for ten minutes, whisking occasionally, until the sugar has dissolved again and no more stickiness remains. The mixture will be foamy. Slowly whisk in the cornstarch mixture and heat over medium-low until the mixture thickens, about 1 to 2 minutes. Stir in the vanilla extract. Scoop the mixture until a bowl and refrigerate. To avoid a skin forming on the top of the pudding, place a piece of plastic wrap on the surface. Let chill 4 hours to overnight. To make the brownies: Preheat the oven to 350°F. Grease a 9x13-inch baking dish. 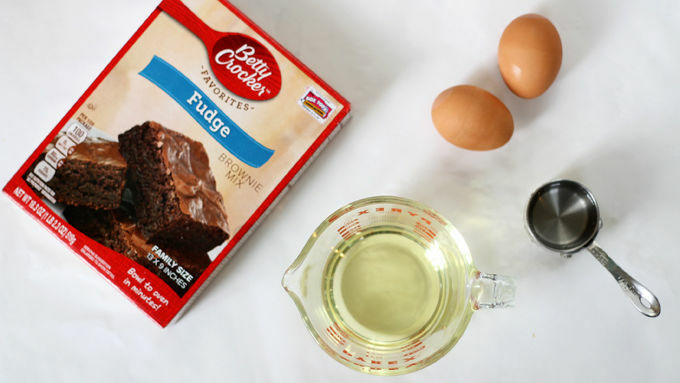 Prepare the brownie batter according to package directions: Stir the brownie mix, water, vegetable oil and eggs in a bowl until well blended, and spread in the pan. Bake for 24 to 26 minutes or until a toothpick comes out clean. Let the brownies cool completely. 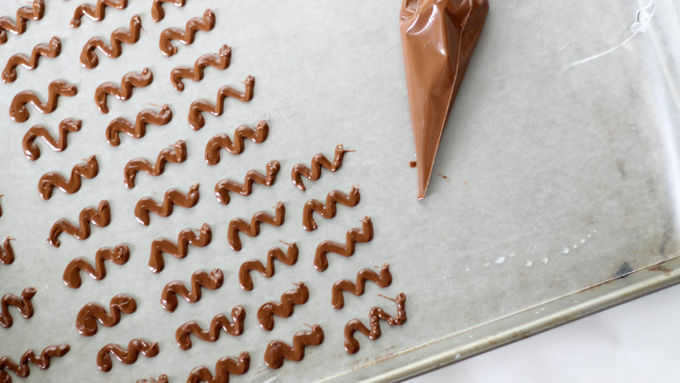 To make the chocolate curls: Line a baking tray with wax paper and set aside. 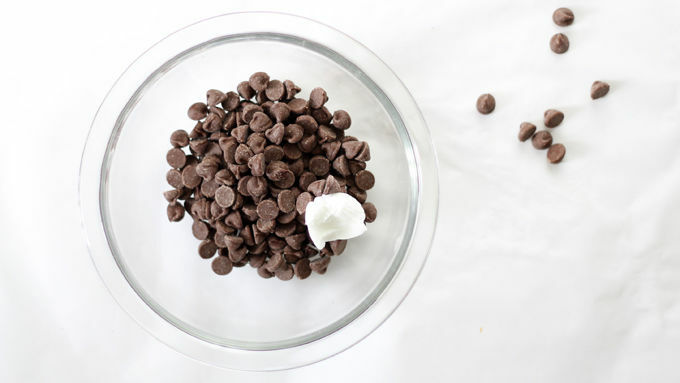 Place the chocolate chips and vegetable shortening in a microwave-safe bowl. Microwave for 90 seconds at 70 percent power. Stir. Continue to microwave at 30-second and then 15-second intervals until smooth when stirred well. Pour the chocolate in a disposable decorating bag or a zip-top bag and close the top with a rubber band. Be sure the chocolate cools just a bit to the touch so you don’t burn your fingers. Snip 1/4 inch from the tip of the bag and pipe small squiggles to fill the baking sheet. Place in the refrigerator until set, about 1 hour. Keep in the refrigerator until ready to use. To assemble the jars: Use a 2-inch cookie cutter or use a knife to cut 1-inch cubes from the brownies. Place a cut-out brownie or a couple cubes of brownies at the bottom of an 8-ounce Mason jar. Use one or two layers of brownies. (You may have leftover brownies.) With a small spoon, scoop some pudding on top of the brownies to fill 2/3 of the jar. Top with a few chocolate curls. Keep in the refrigerator until ready to serve or give. 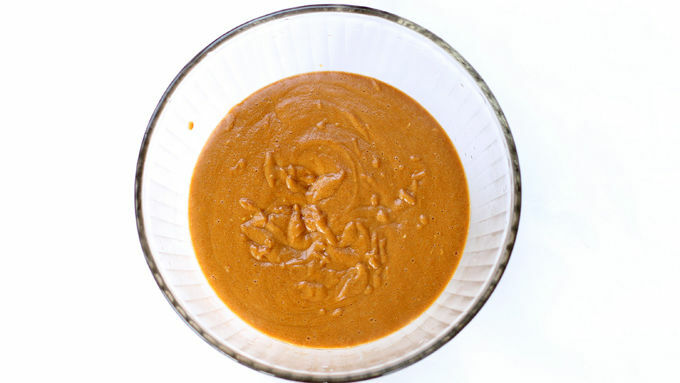 You can substitute instant vanilla or butterscotch pudding for the homemade caramel pudding. Let’s take dessert up a notch, shall we? You can make the brownies, pudding and chocolate “curls” a day or two in advance, and then just assemble the day you are serving (or giving as gifts). 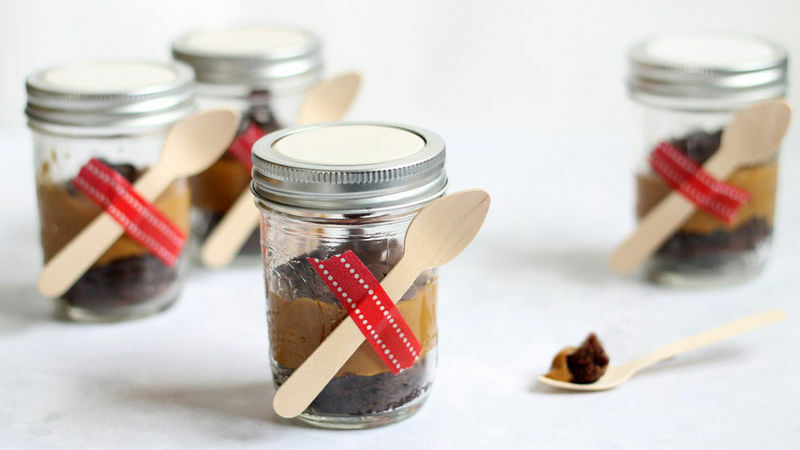 Package in little Mason jars and attach wooden spoons with washi tape or ribbon, and you’ll really feel like you conquered this whole dessert thing. Homemade pudding is fun to make. (Although I should note my idea of fun is no longer salsa dancing all night, but Netflix bingeing!) But if you want to eliminate a few steps from these, you can substitute butterscotch or vanilla instant pudding. Here’s a tip for pouring the chocolate in the bag: Place the bag in a tumbler and fold the top of the bag over the edges of the tumbler. Fill the bag with chocolate, twist the top and tie it tightly with a rubber band. Here I’m using small Mason jars (8 ounce size). Close with a lid and attach a small, wooden spoon with washi tape or ribbon (if desired) and store in the fridge until ready to give or serve. 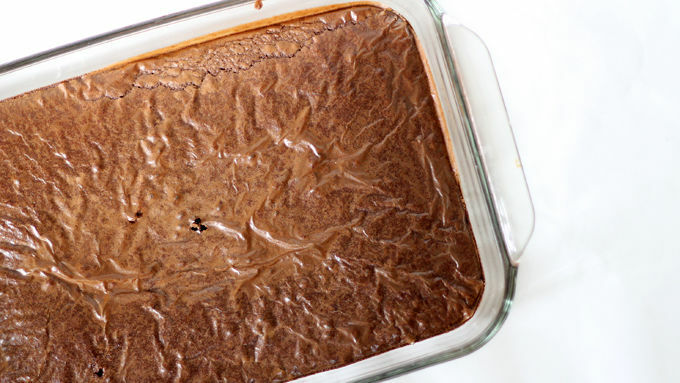 Bonus: If you only did one layer of brownies, you’ll have about half the pan left to enjoy!